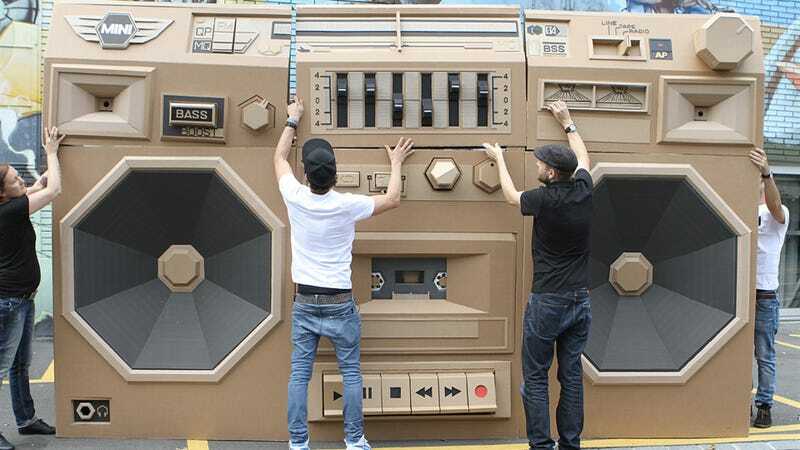 Bartek Elsner, an artist who uses cardboard to build things far more awesome than your childhood fridge box fort, created this monstrous paper boombox for a Mini Cooper dealer in Zurich, Switzerland. What's even more awesome is that the creation works, and is powered by the car battery from a Mini that's actually parked behind the stereo. The piece sadly won't survive the first rain shower that comes along, but that's seemingly half the appeal of working with a material like cardboard. Your work is fleeting, and isn't going to survive for hundreds of years in a museum. That, and when it's no longer needed it can be turned into an awesome fort. Try and do that with the Venus de Milo.